Several titles look back at the multifaceted American experience. 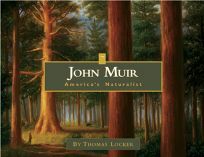 John Muir: America's Naturalist by Thomas Locker profiles the man who helped start the Sierra Club and whose writings were so influential in sparking the conservation movement and the national park system. Muir's devotion to the wilderness comes through in simple language and luminous paintings of Yosemite Valley, a grove of Sequoias and Alaska's glaciers, among other sites; ghosted mini-sidebars highlight quotes from Muir on each spread.